Second, Summerbirds in the Cellar have a video for "Trains" and it's one of only three finalists in the Scion Xpress Fest challenge. If you pop the link below, view the video and vote for it like any decent Orlandoan should, the boys win one of those sweeeet boxes-on-wheels. 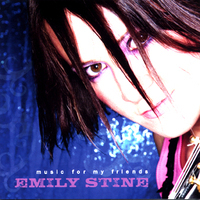 During one evening of FMF2006, I ran into Emily Stine and snagged a copy of her latest release Music For My Friends. Produced and mixed by Justin Thomas (Faktion, Dark New Day), this disc is poised to launch Stine into musical orbit; every track is excellent. From the poignant "Too Cute To Kill Herself" to the all-out rock of "What If I Punched Your Girlfriend", Stine's killer voice coos, sighs, screams and shouts, harmonizes and rhapsodizes through a host of original tunes and a knock-out cover of Heart's "Magic Man", which she not only pulls off, but manages to make her own. Though she's a captivating and energetic performer all by her lonesome, Stine's surrounded herself with heavy-hitting musicians for this outing including Thomas, Kyle Cook (matchbox twenty), Brett Hestla (Virgos), Timothy "Timbo" Diduro and others, which results in a solid sound that spills out of the speakers and says "howdy." I've watched Emily developing her act around Orlando over the past few years and her star is definitely rising. This release has everything it takes to be the afterburner for her career and I hope the ride lasts as long as possible. Tonight's the first night of music for the Florida Music Festival. Even if most of the bands could give me lockjaw from yawning, it's always pretty fun, if only for its pace. However, this year's selection has a conspicuous upspike in respectable local indie acts. Hm, what on earth could've precipitated that? So this year's lineup is actually a great Cliff notes way of becoming educated on Orlando's indie scene, convenient and economical. But I'd never send you into Bar-BQ-Bar dropping names like Dmanufacture, John Frank or Cori Yarckin. Why not? Because I'm a friggin' sweetheart, that's why. The following are local acts playing this year's festival that are worth the while of anyone who's looking for something with some sort of edge. Follow it and you'll be able to house any hipster in a local music debate with your newfound knowledge. I won't tell 'em where you got it. AM Conspiracy (THU, The Social, 9p) - modern hard rock band that's actually good. Medic (THU, BackBooth, 10p) - Britpop whose smart influences go deeper than Coldplay. Derek Lyn Plastic (THU, Blue Room, 10p) - hilarious but truly scuzzy punk rock. Louis Defabrizio (THU, DMAC, 11p) - solo performance by Gasoline Heart front-man. Mike Dunn & the Kings of New England (THU, AKA, 11:30p) - like Ryan Adams? Then go. Matt Butcher (THU, DMAC, 11:30p) - solo performance by The Heathens front-man. X:144 & SPS (THU, BackBooth, 12a) - intelligent hip-hop with the best turntablist in the Southeast U.S., so says DMC. Nathan Bond (THU, DMAC, 12a) - solo performance by Band Marino front-man. Yip Yip (FRI, BackBooth, 7p) - whacked out electronic duo that's getting noticed. The Heathens (FRI, BackBooth, 9p) - one of the hippest alt-country bands in town. Band Marino (FRI, BackBooth, 11p) - currently one of Orlando's hottest indie acts, deservedly. Summerbirds in the Cellar (FRI, BackBooth, 1a) - one of my personal faves in the scene. Monikers (SAT, BackBooth, 1:30p) - slopped-up and scrappy punk rock. The Sugar Oaks (SAT, BackBooth, 7:30p) - spacious, abstract Americana-touched folk. Danny Feedback (SAT, BackBooth, 8:30p) - explosive, bombastic and totally dangerous. Black River Nightmare (SAT, BackBooth, 9:30p) - hard Southern rock. The Hex Tremors (SAT, BackBooth, 10:30p) - scalping blues-punk that plays like a more hateful version of the Immortal Lee County Killers. 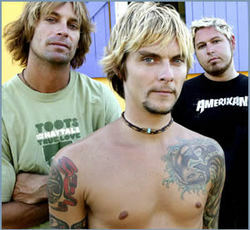 Gasoline Heart (SAT, BackBooth, 11:30p) - muscular, well-informed American rock 'n' roll. Country Slashers (SAT, BackBooth, 12:30a) - stylish Southern punk rock. The Punching Contest (SAT, Firestone, 1a) - incendiary post-punk that'll put you through the wringer. There you go, suckas. See you downtown tonight, tomorrow and the night after. You see me walkin' in, you better have a cold one waitin' for me. These next three days are going to be sick busy, busy sick. Bands, Films, Art. Why don't they add a Sci-Fi Con on to the next one? The concept of drunken Cosplayers really boggles this mind. Anywho. However your path may swing tomorrow night for the first evening of FMF2006, may it swing back around to Church Street stage where Boxelder will be kicking the groove into orbit around 1 am. Yeah, it's a school night. So, play hooky Friday. It's the only way you'll rest up enough to tackle that evening's shows along with Saturday's. Friday's a loss; forget about it. FMF2006 is steamrollin' this way and the Orange County Sherrifs are already setting their tasers for "stun." 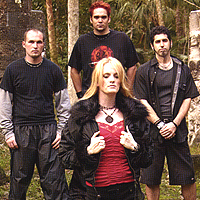 Scheduled to perform is Lucid Fly, a female-fronted rock quartet. Their website has some updates about most recent album Adapting To Gravity as well as the inclusion of one track in an upcoming indie film. Known for rotating line-ups frequently over the past few years but always anchored in the core of frontwoman Nikki Layne and guitarist Doug Mecca, Lucid Fly currently features Justin Thalgott on bass and Derrick Haggerty behind the drum kit. I'll be catching this version of the band for the first time probably with many of you at FMF2006. Their time is due - it's possible that LF could knock one out of the park at their showcase this year.